My Latest NYC Sample Sale Marathon; Tamara Mellon, Korres and More! On Monday I met up with my college-aged niece for a day of sample sale-ing. On our agenda was Tamara Mellon and Korres and we figured we would play the rest by ear. I'm not even sure where to begin with how I feel about the trainwreck that is the Tamara Mellon sample sale. Prices are currently 80% off retail, but in the past, the real draw for this sale were the spectacular 90-95% off bargains. I personally don't believe that her brand can warrant this kind of pricing. We've seen better deals in Century 21 or even on Tamara's website. You can come drool over previous pricing and hauls here and here. I'm gonna warn you now - this post is LONG, detialed and picture heavy - but you're gonna wanna read it slowly so you don't miss anything. They had far less of a selection than past years - at double to quadruple the price. There were a few standouts thou. These blue feather Muse heels would have come home with me had they not been 80% off of $850. (BTW those are my niece's feet - she had a cuter pedi.) That's $170 plus tax - pretty much what I paid for my black Valentino noir Rockstuds. No thanks. Not when I paid $50-55 in years past. Clothing pricing really took a hit. Whereas leather used to be $100 and all other clothing was like $50 - this round was ridiculous. I saw my leather dress that cost me $100 (See me wear it here and here) at the last sale. Being that the RV was $1,495 you can do the math.They also had my $10 yellow dress but the tag was missing the price but let's just conclude that they clearly wanted more than $10 I spent on mine. Sigh. I would have liked a fringed leather skirt or gown this time. Wish I grabbed more last time. The only bags they had this time were a couple styles of clutches. Didn't even bother to look at the prices. I'm linking up a bunch of pieces I spotted so you can shop for them online. Honestly prices are about the same as the sale. The Lulu Frost side had some pretty baubles. Prices started at $25 for pins (didn't see any LOL) and topped out at $115. $30 will get you tie bars, cuff links, key rings, or hair items. They did have some pretty barrettes - I wore several similar pieces in my hair at my wedding, Small earrings are $40 and large are $75, rings are $45, bracelets are $65 and necklaces are $60 for small and $115 for large. Prices were fair but I decided to wait for markdowns. Sale ends on Sunday but I may check back tomorrow for markdowns. I walked out empty handed as did a lot of disappointed shoppers. Win some, you lose some. 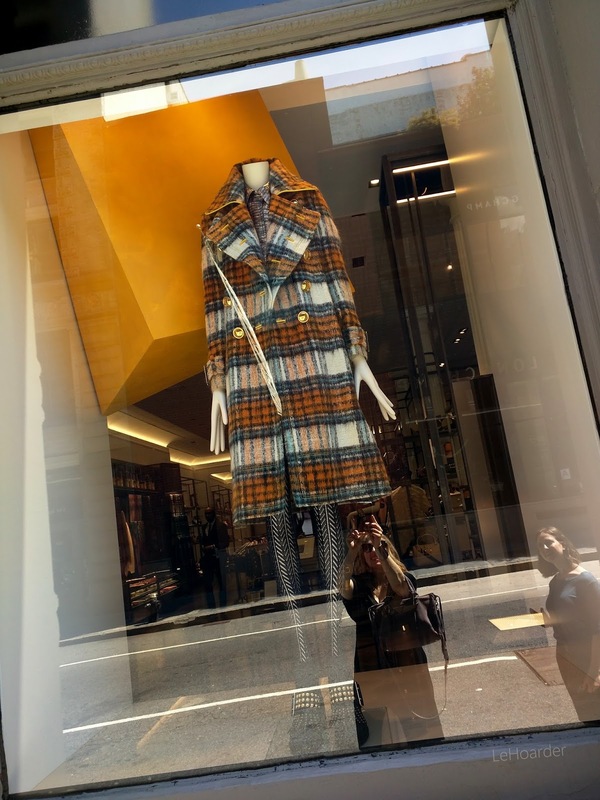 We passed the Burberry store and I spotted this plaid trench coat in the window and fell in love. I need this coat in my life. Only after did I notice the fishnets and chunky boots, which are equally adorable. While I was online at Tamara I tweeted my plans for the day and Korres actually responded that I should check out their sale nearby - which we actually planned on doing anyway. Pretty flattered that brands are tweeting me! When I popped in to say hello I learned that this sale was being held by an outside company and was not an in-house sale. No matter - we still found plenty of goodies on the cheap. Most items were 50% off (some better) and prices started at $5 and topped out at $24.50. This is what my niece took home. 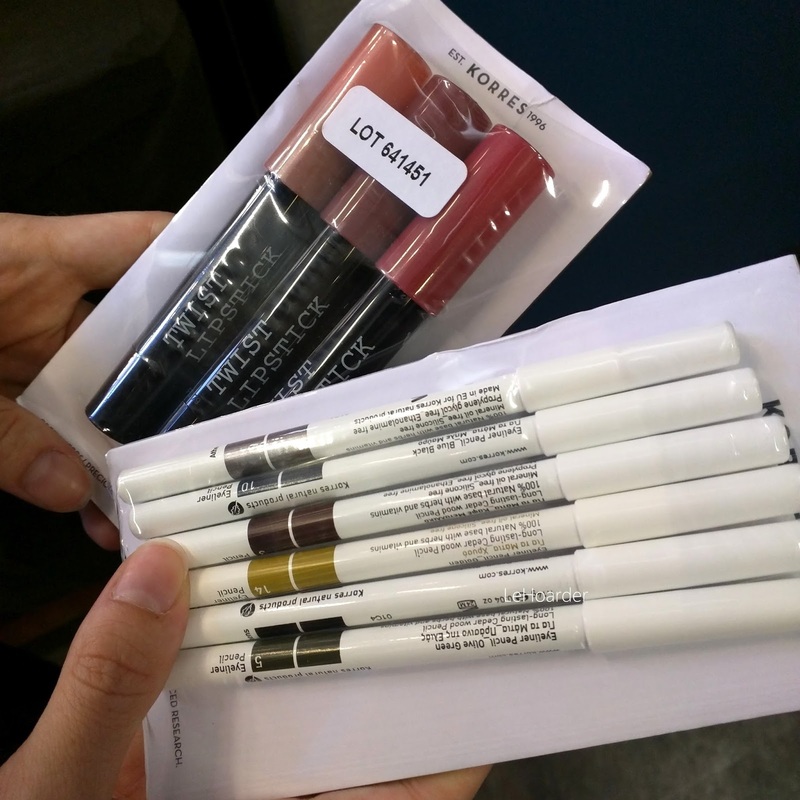 The twist lipsticks were $15 for the trio and the 6 pack of pencils was $24.50. And here's my stash. I needed those eyeliner pencils too - they're actually how I got hooked on the brand. I have super sensitive eyes and I found them in Sephora and became obsessed. Then Sephora stopped carrying them. They do have them online at HSN but half price at a sample sale is always better! Be sure to check the dates thou - some products were towards the end of their expiration. The Magic Light Eclat Magique was a killer deal - it was $14 for both. And they retail for $28 each! Score! I was disappointed that they didn't have their mascara. I've tried hundreds of different brands and formulas over the years and their brand is hands down the best. Doesn't bother my eyes (as so many products do!) and gives you that pretty, non clumpy, doe eyed look. My lashes are invisible without mascara so I don't know what I would do without it. They've had a few formulas over the years and I've loved all of them. After Korres we popped in to the Yohji Yamamoto eyewear sample sale at Flying Solo boutique (224 Mulberry Street) which was essentially a pop up in a retail space which a handful of designs for $135 each. If you're a super fan it's worth it, otherwise just wait for the next Modo eyewear sample sale and grab some cheap sunnies for $20. My niece then took me to by Chloe which is Vegan (kosher) fast food by Chef Chloe Coscarelli and it was soooo good. It was my first time and I didn't know what to order. 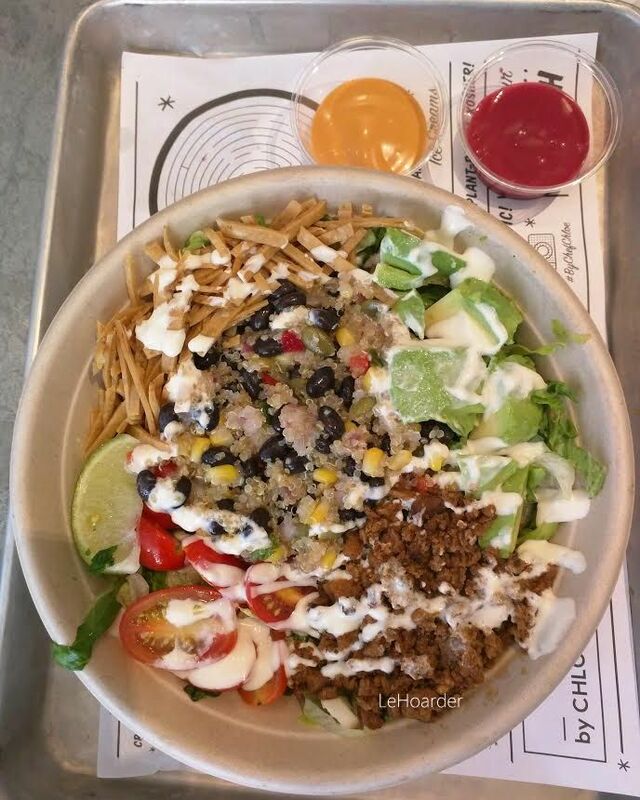 I was torn between the burgers and the salads but I decided I wan't craving carbs so I went for the quinoa taco salad. I also sampled the beet ketchup and it was so delish that I ate it straight up with a spoon. I can't wait to go back! My niece ordered the avocado pesto pasta and the Greek salad - which was totally my second choice. I'm glad I went with the taco salad because the agave-lime vinaigrette sounded delicious - and it was! For me the dressing can make or break a salad and most Kosher places just don't get that. 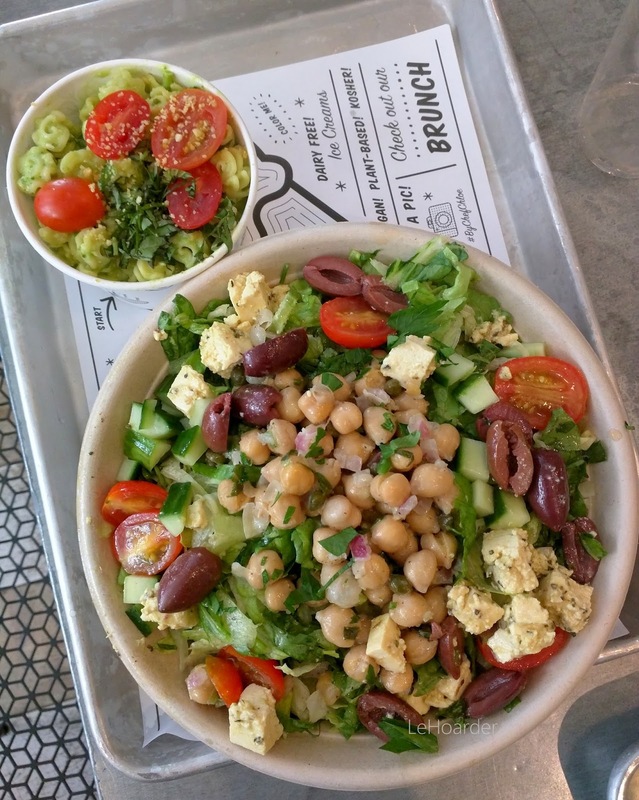 Honestly I'm not sure I'd go back to the West Village location (185 Bleeker) because it's a little off the beaten path for me, but the I'll be at that Flatiron (60 W 22 St.) location next time I hit the City. I just saw on their site that they have an app (download android here and apple here) - I downloaded it and you can earn $10 in credit for every $100 you spend. After we parted ways I started walking uptown. I stopped at the Rack at 14th street (nothing good) then on to 260 Sample Sale to check out their end of season sale. I went last year and it was total crap. This year had some hidden gems. Even though it wasn't posted, they did not allow me to to take photographs of what's inside. I'm such a goodie goodie - I always ask...and I always seem to ask the wrong person because then I see other reports with pictures LOL. No matter - I'll paint my own picture and tell you what's inside. Prices ranged from $5-50. I saw odds and ends from DVF, Zadig and Voltaire, Maiyet, Vera Wang and more. but like I said, odds and ends - emphasis on the odd. The better clearanced leftovers are downtown at their 151 Wooster Street location - but for way more money. At these prices it's worth a peek if you're in the hood. My best find was this Maiyet fringed tweed jacket that retailed for $1750 - I got it for $50! 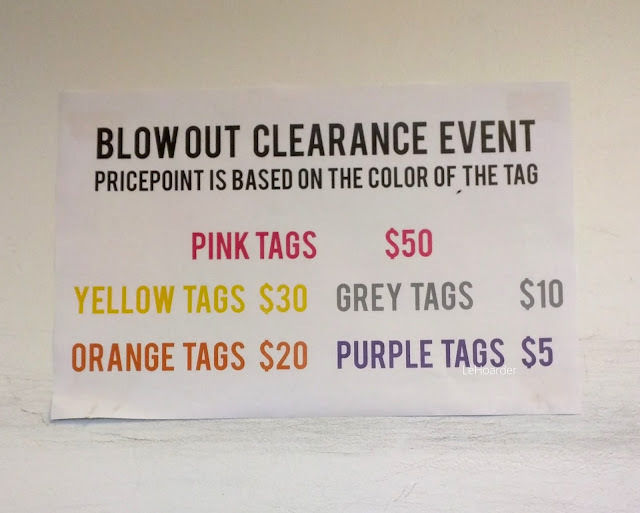 All merchandise was organized by colored tags. Pink tags are $50, yellow tags are $30, orange tags are $20, grey tags are $10 and purple tags are $5. I grabbed this $30 Maiyet dress partially due to it's $995 price tag. They had a bunch so I grabbed it in two sizes. Interesting designer LBDs are always welcome in my closet. I actually passed on a $20 DVF shirt dress because it was too small and I saw another girl eyeing it. I just handed it over because I was feeling cheap and generous. Last but not least, I had to share my bag of the day. Say hello to my Rebecca Minkoff fringed Regan satchel. It does look really similar to my Balenciaga but the fringes and color sold me. And it was only $75 (RV $425). It was one of the few samples I picked up at her last sample sale because prices increased from $50 - and it always drives me nuts when they get greedy and prices go up. And the cuff is $5 sample sale find from A.V. Max. Love my power cuffs! I was going to include all my TJ Maxx/Marshalls yellow sticker clearance hunting in this post as well but this one was long enough LOL. I'll have that up shortly. You can read about some of my past hauls here, here and here. But for now - get yourselves to your nearest stores and see what you can find!! ETA: The Tamara Mellon discount ended up maxing out at 85% off over the weekend so I never went back. So disappointing. Love your photos! DSLR does make such a huge difference but I can't bear lugging mine. Sounds like great deals on Maiyet. I just posted about my finds at their Wooster St location. Definitely more than $50 but worth a peek :) Hoping for extra markdowns at Tamara and Lulu! Thanks D! I stopped bringing it for every sale but I knew I needed it for this one. I saw your report - I'll be sure to pop in next time I'm down there. And ditto! Fingers crossed! Wow bummer about the price increase but glad you got some goodies at Korres! Can't wait to see your TJ Maxx finds! Yeah but what can you do. I'll just patiently wait till the next amazing deal and stock up then...so far I didn't get a thing at TJ. This round isn't as good. So amazing collection, love these shoes! That bag is so nice, see it online at full RV. Was anxiously awaiting your shoe haul. Maybe the prices will be better by the weekend. As always, love your style and shopping skills. Thanks - I actually never saw this RM in this color - Nordstrom had it in brown which was actually very pretty. Hoping TM drops otherwise I'll make my peace with all the cheap stuff I already own of hers.